Renault Trezor grabbed all the eyeballs at the 32nd Festival Automobile International that was held in the Hôtel des Invalides in Paris. This all-electric car not just won 'The Most Beautiful Concept Car of 2016’ title, but also won the hearts of many and deserves all the praises. It is truly a stunner because of its uniquely fine exterior and a chic interior. According to Automotive World, the Renault Trezor's lines are "warm, sensuous, and refined". The technology, stylish appearance and futuristic feel of Renault Trezor are inspired from the French carmaker. The car is a two-seater all-electric coupe having more futuristic feel than the Renault DeZir. Undoubtedly, Dezir had set a benchmark of futuristic design back in 2012, but Trezor has gone one notch above. Its design is a perfect combination of feelings and maturity. "It is the epitome of a concept car and we were notably won over by the cohesion of its overall design and the attention that has been paid to the details. It is a fine creative work which, we hope, will inspire Renault's future road-going models." The electric car Renault Trezor was created & designed by the Formula E. It is 4,700 mm long, 2,100 mm wide and 1080 mm tall. It is powered by high-speed electric powertrain and 2 batteries. It takes hardly 4 seconds to reach 100 km sprint from 0. For Formula E racing, it also has a brake operated energy recovery system of RESS technology. The car’s exterior has one visible seam that connects the roof to the bottom half of the car. As for the interiors, the windshield is red-colored highly in contrast with the body paint. It is coupled with high-end technology including an OLED touchscreen which is shielded by Gorilla glass on the steering wheel and the center console. 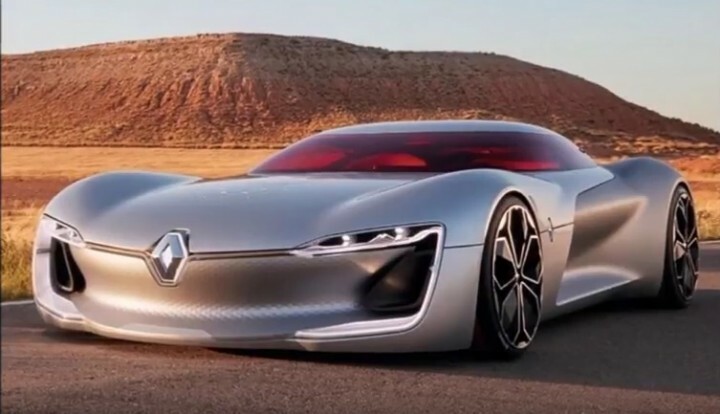 The Renault Trezor is the proof of the high level of imagination and unfortunately one will not be able to ride it on road. The reason being that it’s just a concept car, nothing more than that. But yes, it can get into the production line in some form.